The firm W Bill was founded by William Bill in 1846, in Mold, North Wales. Originally WIlliam Bill specialised in blankets and Welsh flannels, but they soon branched out into tweeds and later into the finest cashmeres. Initially using tweed for menswear was a radical move, popularised by the Duke of Windsor in particular. and the firm moved to London in 1892. W Bill tweeds and knitwear were worn by Picasso, Shacketon and Hilary. The firm also exported a lot of cloth to the US through Brooks Brothers and other suppliers. Until recently fabrics for tailored suits and mens’ outfits were available in the Saville Row area, kept in vast vaults. The tailor could send out for a bolt of cloth (with say 100 metres on it) and it would be brought around to drape on the customer. Personally I find this is the only satisfactory way to buy fabric. Choosing a nice colour and fabric from a pattern bunch is just not the same experience as feeling the weight and drape of a fabric on your body and seeing the impact of the texture, scale and colour against your own shape, size and colouring. I first heard about this company though an article in the Financial Times “How to Spend it” Magazine. It explained how the vintage fabrics are in demand because of their quality, the fact that they are “London shrunk” and much more robust than contemporary clothes. Until 1988 the firm was run by descendants of William Bill. The company was sold in March last year, having been sold by the family in 1990. The name is now owned by a major supplier of cloth to the tailoring trade. The whole warehouse was liquidated and the cloth ended up with tailors, on eBay, and in local sales. 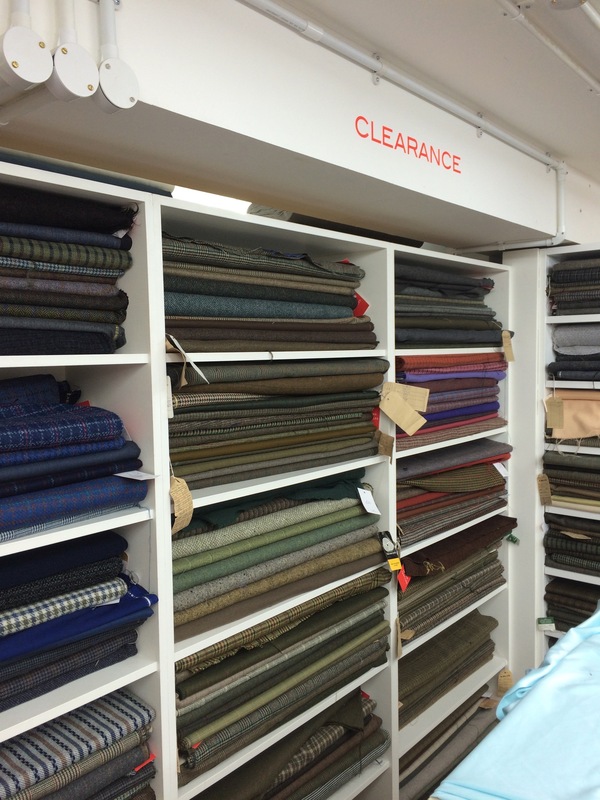 Anyway the other day I dropped into one of my favourite London fabric shops Misan, in Berwick St, which has a ( rather pricey) bargain basement. There are some super choices here. I was very pleased to get the yellow wool that I have used for Esme’s coat. And if you can’t get to central London there is some W Bill cloth available on eBay. Many thanks for this Jay. Fascinating. I love those Pathe newsreels. I will visit Misan next time I invade my daughter’s flat for the weekend. I got mine from Misan too. I think I spent 30 minutes+ touching every bolt, never sure enough which one to get. It was hard, I know I made the right decision, but I think I’ll go again for an orange wool. I hope it will still be there! It is a tempting selection isn’t it, Geo. I am so glad we met in the flesh. Oh my goodness how drool-worthy and how sad re. the ending of a firm like this. I can see at least one bolt of green that I would want to buy immediately. I’m also imagining being draped in this cloth – a lovely thought for this morning. Oh my gracious, what wonderfully stocked shelves! Sad when the old stand-bys have to go, isn’t it. There are lots of fabulous coats-in-waiting there…. I visited but didn’t buy as I’ve no plans yet for items which require this quality; one day for sure, but quite a few techniques away yet. I worked for W. Bill when I was 18 years old. I worked in the office just off of south Malton Lane. I think it was off New Bond St. I was an invoice typist. We typed all the invoices for the cloth which used to go overseas to Japan and the USA. I left when I had my firs baby in 1968. I then came back to work for the Bills when they moved to Kentish Town in about 1973 when by then my two children were at school and nursery. I once again typed invoices and was on the reception desk also answering the phones. Mr. David was there and also Mr Soward. We had a large place there where all the cloth was cut and packed and sent overseas. It was a wonderful firm to work for. The cloth was the best you could find anywhere.Such a good family. They were very good to me. I only left in 1975 to start a new life in Australia. I did keep in touch with Mr David Bill and his wife Eleanor, and even saw them when I came back to England for a visit. I kept in touch until they both passed away. Hello Laura – thank you so much for adding your personal story here. It brings the company to life for readers. So much is has changed in the world of fashion and fabric in the UK it is nice to recollect how it used to be. Steven – Thank you so much for stopping by and leaving your interesting story. I really appreciate it.